Take on a new generation of colorful power with the Thermaltake Smart Pro RGB power supply Series. 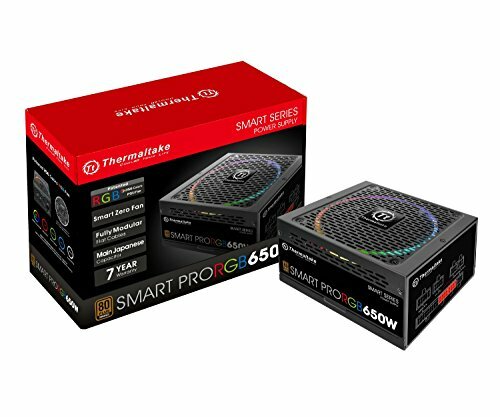 Featuring capacities ranging from 650W to 850W and 80 plus Bronze certification, the Smart Pro RGB Series adopts high-quality components with a fully modular design that always accommodates any mainstream build under any circumstances. Colorful options at your fingertips allow easy access to RGB modes and stay silent with Smart zero fan capabilities for Ultra quiet operation. Upgraded 140mm Ring RGB fan produces higher airflow allowing the PSU to take on case heat exhaust with ease allowing users to "face up" the power supply for even more cooling. Take on more than just power with the Thermaltake Smart Pro RGB power supply Series. Scored 91% on Tweaktown and also awarded with their "Must Have Best Value Award"
Efficiency: Meet 80 PLUS Bronze at 115Vac input.